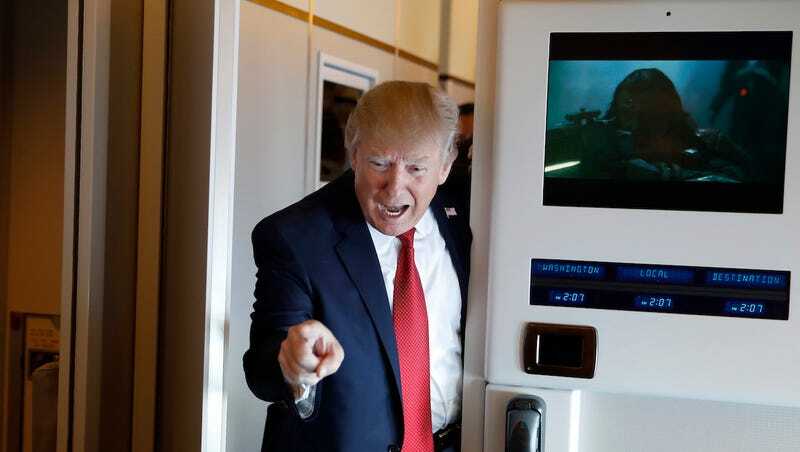 The press along for the ride on Air Force One today decided to take advantage of the fact that Rogue One was just released on DVD. And they kind of forgot to pause the movie while President Donald Trump addressed the use of chemical weapons by the Syrian government. We know that they didn’t pause the video because the images of the flight show a variety of Rogue One moments upstaging whatever nonsense was being said. And there’s clock counting down how much longer the flight is below the video. There’s nothing here about whether or not, after saying that “Something should happen” in Syria, Trump stayed to watch the movie featuring a lead who rediscovers her ideals and takes on a suicide mission to fight a corrupt and evil totalitarian government. Update: Star Wars icon Mark Hamill, when asked about the image of Trump walking in on the Rogue One screening, responded as only Hamill could.